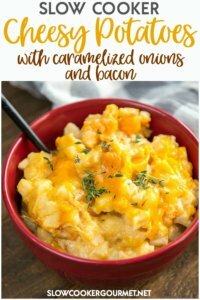 Slow Cooker Cheesy Potatoes with Caramelized Onion and Bacon are quick, easy and absolutely delicious. These are perfect for holiday dinners and anytime you need to serve a crowd! 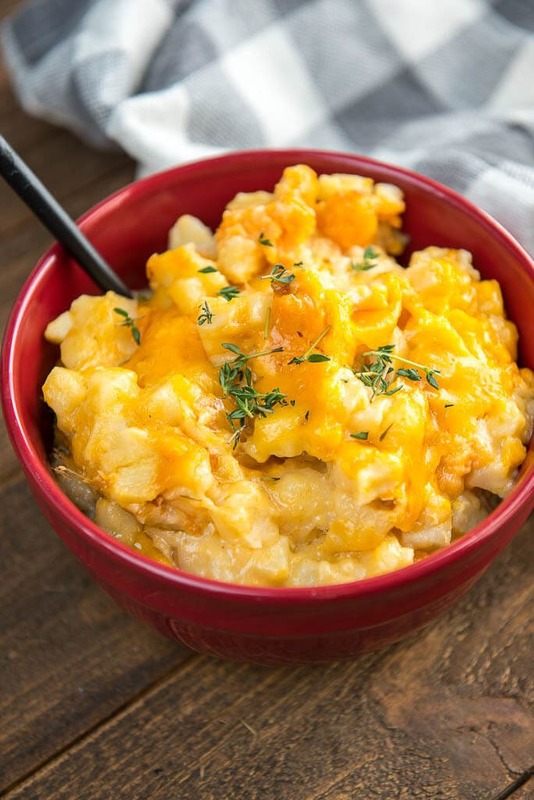 Is any family holiday dinner complete without Slow Cooker Cheesy Potatoes? I think not!! And making them in the slow cooker is a great idea so that you don’t have to take up any oven space! I changed up the standard cheesy potatoes recipe to add some bacon and caramelized onion. You don’t mind, do you? Along with extra cheesy goodness? 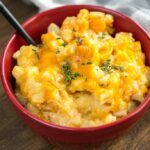 These don’t have any canned cream of chicken soup… just a super simple, made from scratch cheese sauce for lots of extra cheesy bites! Also, some cubed hash brown potatoes to keep it simple providing comfort food at it’s best! One of our favorite meals to serve these with is BBQ. The creamy cheesiness is the perfect match! My mouth is watering just thinking of these with the ribs we had last week! Most of all, the great thing about making your own cheese sauce is that you get to use whatever kind of cheese you love! 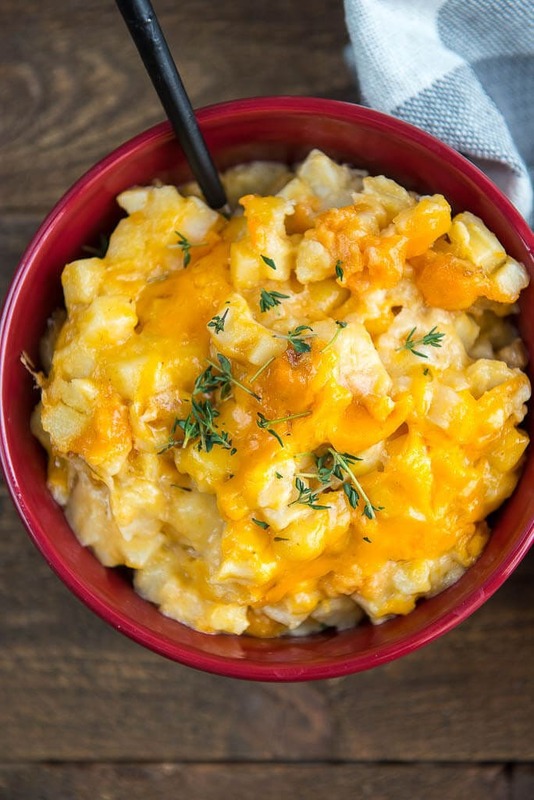 For us it’s sharp cheddar but you can use so many different things! You just want to make sure it’s a cheese that melts well. You could even mix up a new and amazing cheese blend! If you haven’t tried this yet, you will be impressed at how simple it is to make, and you may never go back to cream soups again. Chop up some bacon and add it to a hot skillet. Let it start to brown up and then toss in your sliced onions. Let everything cook until the bacon is nice and crispy and the onions are soft and brown. Use the same skillet to make the cheese sauce by adding the flour, broth and cream. Season and stir in the cheese and your done! This doesn’t include any sour cream, but if you are creative, you could customize the cream sauce and add some! Use a bag of cubed hash brown potatoes to save yourself the work of peeling and chopping. Get these going in your slow cooker and have lots of time to focus on the main dish. Or make a main dish in the slow cooker too and have lots of time to focus on your guests!! Anytime you want to feed a crowd without spending all day in the kitchen! 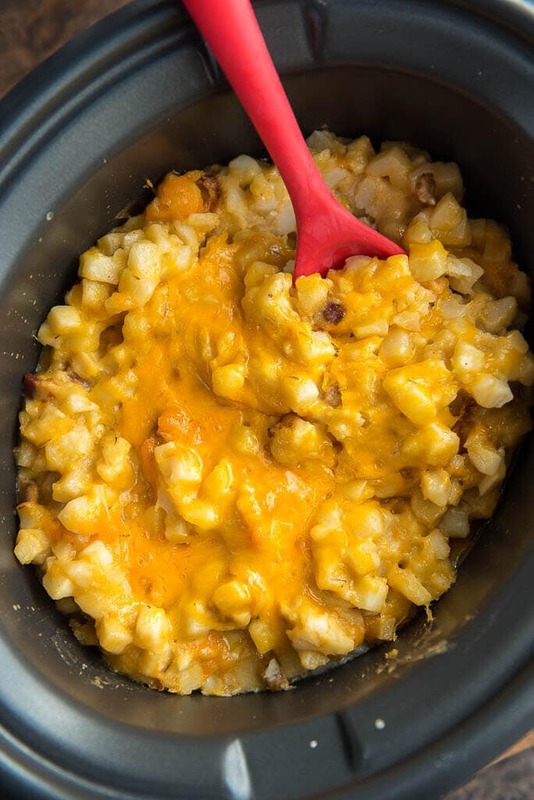 You will need a 4-6 quart slow cooker for this recipe. 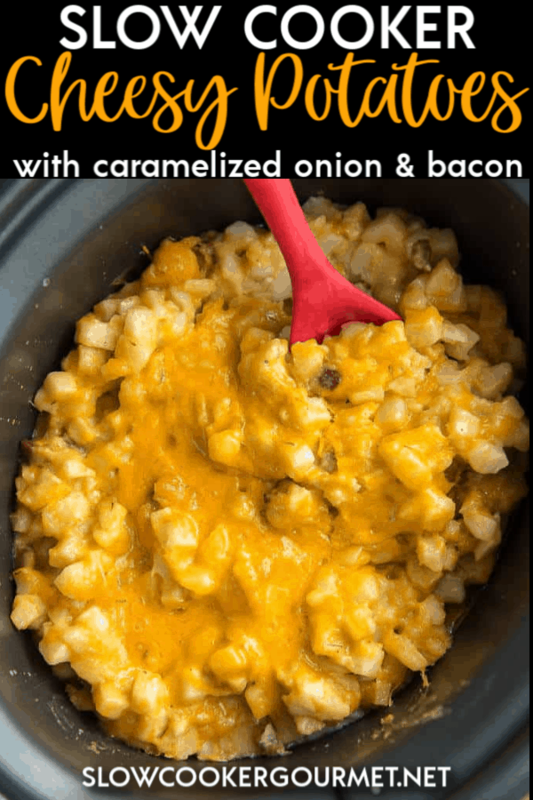 If you don't enjoy onions then you can simply leave them out of this recipe and it will still be delicious! I make this either way depending on our current mood. This recipe was originally published on September 2, 2014 and has been updated to include fresh photos and recipe improvements. Yes, although I haven’t tested it for the specific recipe so I don’t have the times/temps to give you. Could I freeze this in portions? Would it be better to freeze it before or after cooking in the slow cooker? I honestly wouldn’t feel right advising this one as a freezer meal at all. With the cheese and dairy, it would tend to separate and not be as appetizing. First….I am a potato fanatic. Bacon makes EVERYTHING taste better. Cheese and onions are like icing on the cake. 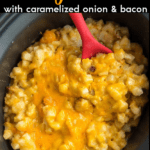 What is not to like about this dish….and I LOVE using my slow cooker.